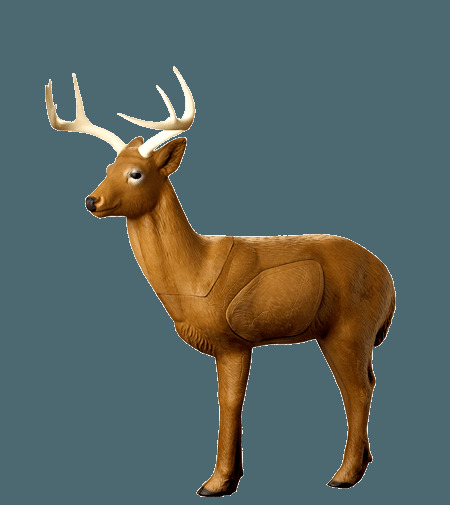 With its head alert-forward, body frozen in semi-sneak position and eight-point antlers standing tall and strong, the Rinehart Woodland Buck is just the ticket for true-to-life practice before heading into the field. Long lasting durability is ensured with Rinehart’s FX Foam technology, completely molded from nose to tail with no fillers. And while Rinehart’s FX Foam ensures archers receive the best value for the price point, the core of the target is constructed of Rinehart’s renowned solid “self-healing” foam – ensuring it’ll outlast even your longest, hardest practice session. Plus, like many of Rinehart’s award winning targets, it features the company’s patented replaceable locking insert – once again saving archers time and money, without sacrificing quality of practice.